One of the most popular dining spots in the Napa Valley is the Rutherford Grill. The lunch crowd includes locals, vintners and tourists. Bring a bottle of Napa Valley wine, no corkage. The Rutherford Grill has menu items that have become cult-like. These include the cornbread, the rotisserie chicken and butternut squash enchiladas. We now can add the Rutherford Grill Veggie Burger to the list. We dined at this cozy restaurant last Friday, and we all agreed the veggie burger is delicious. It almost looks like a regular hamburger. In fact, our waitperson told us that very often when she brings the veggie burger to the table, the customer reacts with “I ordered a veggie burger, not a hamburger.” The Hillstone Restaurant Group that owns the Rutherford Grill is very secretive about their recipes. One can Google “Hillstone secret recipes” and likely discover what amounts to a very close match to the real recipe. The Rutherford Grill is at 1180 Rutherford Road in Rutherford. It is on the corner but easy to miss driving along HIghway 29. If you do not have a reservation, prepare to wait a significant time outside in the lovely garden. Of course, that is a good excuse to order a glass of wine. In Yountville, the Rutherford Gill has a sister restaurant, also very popular, the R & D Kitchen. The beautiful rolling hills of Napa Valley invite thousands of visitors every month, and rightfully so. This is a destination known around the world for its splendid beauty, warm weather, as well as the wine making industry. This relaxing area is filled with opportunities for enjoyment and education, especially if you’re interested in the process that goes into your favorite adult beverage. Boasting internationally known wineries such as O’Brien Estate, V. Sattui and Darious, you’re in for an exceptionally memorable winery tour. There are options to visit the tasting rooms, lounge on the patio areas, or embark on a tour with the knowledgeable staff. You can customize your Napa Valley Wine Tours based on your preferences for atmosphere, eating options, and wine type, and that’s a great thing if you happen to have a group along for the ride. Using professional transportation for your Napa experience is something that should definitely be considered. After all, you want to experience whatever is on your itinerary in the most convenient fashion to enjoy it to the best of your ability. If you’re new to the area, finding directions and navigating your way to potential wineries will prove to be a bit challenging. 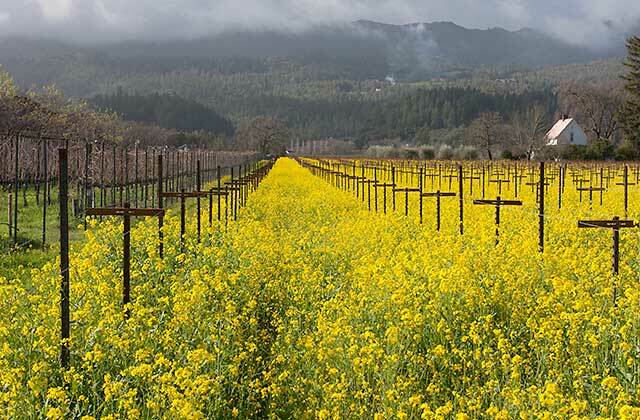 This is why both visitors and residents of the area take advantage of limousine and party bus rentals for their Napa winery tours and sightseeing. We always recommend checking in with wineries beforehand to ensure that they’re able to accommodate these types of vehicles at their estates and vineyards. It’s worthy to note that some of the smaller spots will require appointments and reservations that can be booked up well in advance, so this is another important reason to open up communication before planning a special getaway with your loved ones. This will result in a smooth transition from one winery to another, and no confusion on either side! With a party bus or limousine, a professional chauffeur with first hand experience of the venues is able to whisk you from one destination to the next. This way, you wont have to worry about things like finding a designated driver, holding back on your tasting options, or dealing with the process of driving to multiple wineries and vineyards in one day. It will be an entirely smooth process of hopping from one quality spot to the next. You can either plan your own itinerary, or ask the driver for some suggestions, as they’ve been in the drivers seat for plenty of events such as this. There’s no way to have a bad time when you’re enjoying local hot spots and enjoying their selections along the way! It’s a perfect way to celebrate an anniversary or bachelorette party. The features that can be found inside luxury transportation vehicles make it even easier to decide on reserving a limo or bus for your adventure through Napa Valley. There is upholstered leather seating found in the spacious interior, and the cup holders make it easy to enjoy some of your newly purchased beverages on the road if you so choose. There are high-quality audio systems with sub woofers and auxiliary capabilities, and this means you get to pick your playlist! The neon lighting and television screens are more amenities to consider. You’re guaranteed to have a relaxing experience socializing with your guests for the duration of your travels. On a quiet morning, we walk in the vineyards in St. Helena in the Napa Valley. Listen to the sounds of Fall and view the beauty of the vines at this time of the year. 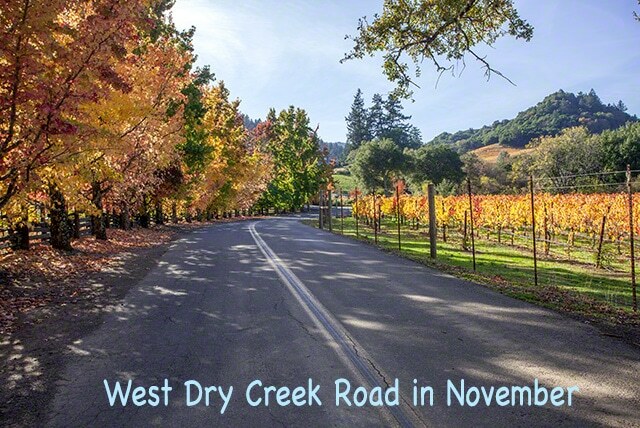 West Dry Creek Road in November is one of the most serene and pleasant roads in wine country. The smell of Fall is in the air around every wonderful twist and turn of this laid-back wine country road. West Dry Creek Road begins at Westside Road just outside of the Healdsburg downtown area. The majestic Madrona Manor is where you start your journey along West Dry Creek Road. The West Dry Creek Road stretches along Dry Creek for ten miles to the Bella Vineyards and Wine Caves. There are two other entrances to West Dry Creek Road from Dry Creek Road. There is the Lambert Bridge Road four miles from Highway 101 and the Yoakim Bridge Road about eight miles from Highway 101. If the weather permits, a November picnic along this road is a must. We have some favorite picnic wineries along this route: The Lambert Bridge winery, Quivira Vineyards and Preston Vineyards at the far end of West Dry Creek Road. Both Quivira and Preston are organic and sustainable wineries. You can purchase a picnic lunch in Healdsburg at Big John’s Market or the Oakville Grocery. On Dry Creek Road, there is the Dry Creek General Store. This area of Sonoma County is famous for Zinfandel. But just about any wine, red or white, is delicious. Most of the wineries along this route are small, boutique, and family-owned. 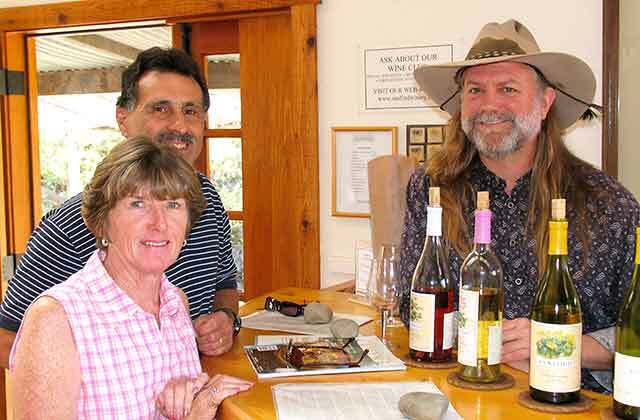 Here is our list of favorite wineries on the West Dry creek Wine Trail. The movie “Sideways,” which I believe to be the best wine movie ever made, is ten years old this October. It is much more about wine, but the effect it had on two wine varieties cannot be denied. It has been ten years of Pinot Noir glory since the movie focused on the greatness of a well-made Pinot Noir, especially from the Santa Barbara wine country. The movie just about destroyed Merlot because of one simple statement by the character Miles. Now here we are, ten years later, and the price of California and Oregon Pinot Noir has skyrocketed. Good Merlot is back and popular again among all types of wine drinkers. This movie holds a special place in my heart for several reasons. First, I love wine and a good story about wine. Secondly, Janelle and I had visited the Santa Barbara wine country in October of 2004, one month before the “Sideways” movie was released to all theaters. We had already known about the movie from our son who works in the movie business in Los Angeles. We stopped in at the Sanford winery where Chris Burroughs was working the tasting room. When we asked if he knew about the movie, he perked up. “I’m in it.” The way Chris talked about it, we thought he had a huge part in the movie. He said he had to join the Actors’ union and went on and on about rehearsing his lines. As it turned out, Chris ended up having one very short line in the movie. It was a lot of fun listening to Chris and getting this photo with him. Another reason I loved this movie is it reminded me of guys I knew and traveled with years ago. I think every guy can relate the characters of Miles and Jack to someone they’d hung around with at some point in their lives. Finally, the movie was a great diversion for me. I saw the movie at the Stonestown Theater in San Francisco on November 10. The next morning I was to undergo a significant heart procedure to rectify an irregular heartbeat. The “Sideways” movie was just what the doctor ordered. “Sideways” was a movie for me that I remember and ponder frequently. We have are own DVD of the movie and watch it again every so often. There are many great scenes in the movie but this one is my favorite. The character Maya speaks about wine. “Sideways” also brought a lot of fame and fortune to the Santa Barbara wine country. Over the last ten years, the wine country has grown dramatically in the number of wineries and tasting rooms. In 2004, the wine country town of Los Olivos had less than ten tasting rooms. Today there are twenty five. Santa Barbara is not just about Pinot Noir, but much more. Many wineries, especially those further east from the Pacific Ocean, focus on Rhone-style wines, both white and red. We have mapped out a two-day wine route that follows the wineries that were featured in “Sideways.” Follow the adventures of Miles, Jack, Maya and Stephanie. Stop in at the famous Hitching Post and try some of their Pinot Noir. Before heading to Santa Barbara, order the movie “Sideways,” and then follow our Sideways Wine Route. It will be a treat. Last week we spent one night in downtown Napa. That is not much time to explore Napa but enough for us to discover some wonderful delights and a few things not so appealing for tourists. The new Avia Hotel is where we lodged for one night. It is certainly a very beautiful venue but so new that a few kinks need to be ironed out. The price for our room was listed at $900 a night on the door. We received an alert from the Travel Zoo and paid $119 for our room. I can’t imagine anyone paying the full price in this economy. I’m not sure how the organizers of the Wine Blogging Conference found sponsors or determined what events were to be staged, but clearly Sonoma wineries were at the forefront of this inaugural event. Except for the Culinary Institute of America, which conducted the blind wine tasting event, Napa Valley and its wineries were nowhere to be seen at this conference. Sonoma wineries went all out for this event. From the opening event, a lunch and tasting of 12 Sonoma wines at Kick Ranch Vineyards, to the final luncheon on Sunday, just about every event featured Sonoma wines. The major sponsors, the Winegrowers of Dry Creek Valley, the Sonoma County Tourism Bureau, and Sebastiani Vineyards, provided lunches, dinners, bus transportation, and more wines than we could possibly taste. What a coup for Sonoma wineries.